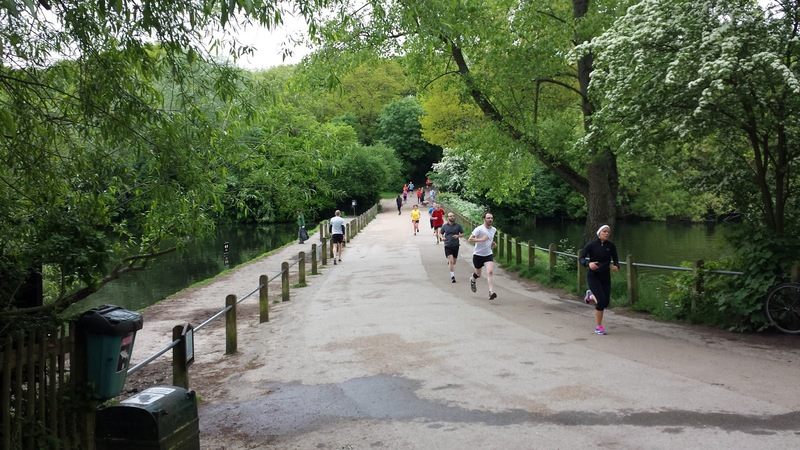 When I mentioned that I was going to Hampstead Heath parkrun, the first thing people said to me were 'it's a bit doggy' or 'there are loads of dogs there'. So given that I feel slightly on edge when running with dogs around I was a tad anxious about this venue. To reach the venue I had the choice of taking public transport or cycling. 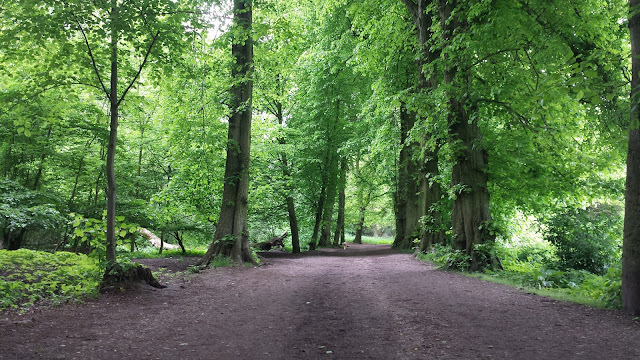 My transport mode of choice at the moment is the bike, so I cycled the 8km route to the heath on a slightly cooler than expected first of June morning. There didn't appear to be any bicycle racks anywhere near the start/finish area. However there are a few posts and fences (plus some wooden ones around the car park). The closest real bicycle racks I spotted were on the other side of the road, opposite the car park entrance (corner of Downshire Hill). There were others further down the road, near Hampstead Heath train/overground station. 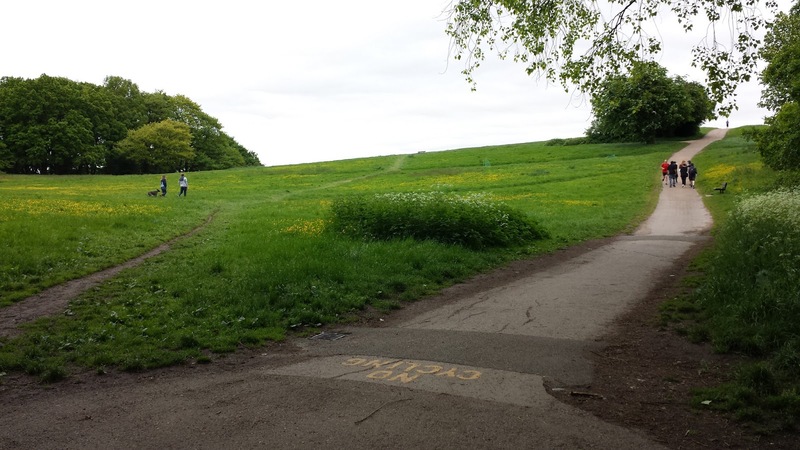 There are toilets on the heath but not anywhere near the start/finish. If you think you might need them before you run, I'd arrive in good time to search for them (the closest ones appear to be in the South-East corner or over to the West side of the heath). Edit: Check out fitzogram's comment in the comments section for more information. This venue has two official courses. There is course A, which starts near the car park and course B that starts a few hundred metres to the west. It is worth checking their news or facebook page the day before the run to see if they are switching to course B. Course A's start/finish area is often required for use by funfairs or other events - course B swings into action to save the event on these occasions. During the pre-run briefing, runners were invited to partake in a post-run swim in the Hampstead Heath bathing pond. For those that had cycled to the run, the morning could be like a mini-triathlon. I settled for my mini-duathlon-type-thing (or brick session, but with a longer than usual transition phase). 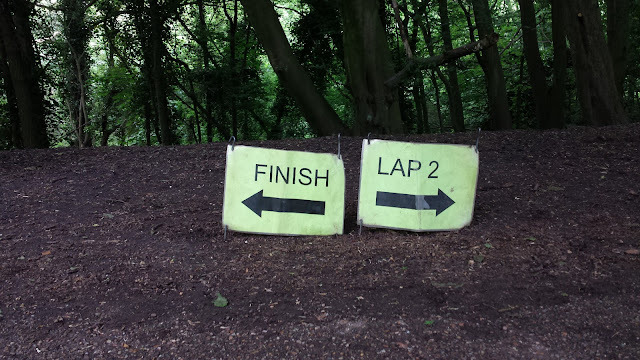 Both courses have you running the same two-lap loop around the heath, they just use a different start/finish area. 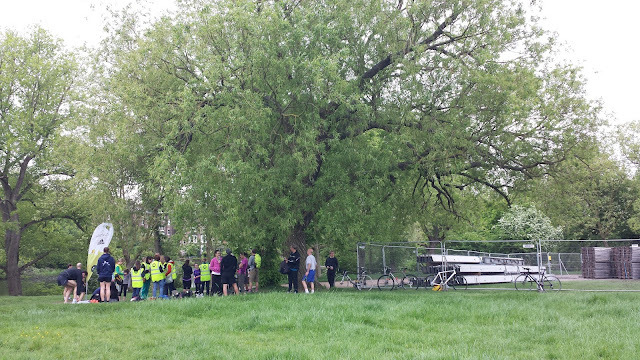 On the day I ran here, course A was in use but had a slightly altered start/finish due to the construction of the Hampstead Affordable Art Fair - Their security fences provided a handy place to secure the bike during the run. Underfoot you'll find a mixture of cracked tarmac, smooth tarmac, gravel, and compact dirt. I ran during a drier period of the year but I imagine that if you're running in the winter you'll find the dirt section a little muddy - Even though most of the course is tarmac, I'd probably were trail shoes in the winter - but only because I don't like getting my road shoes muddy. 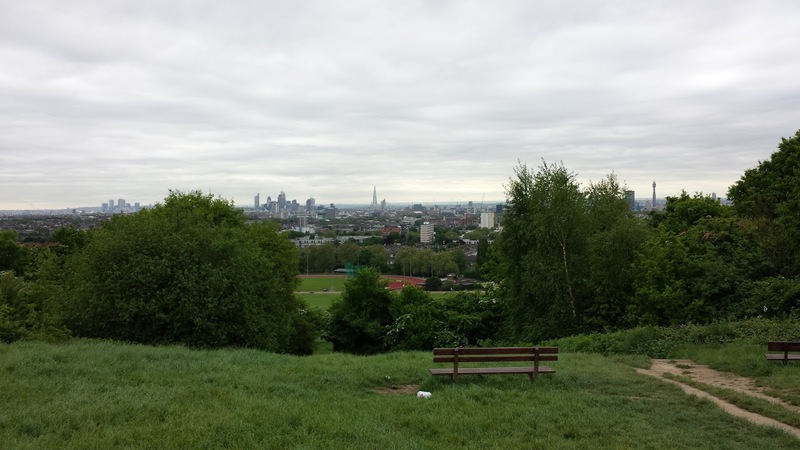 Parliament Hill, which is probably the most famous hill in London, is part of the heath. It has the most fantastic panoramic view across the centre of London which draws in locals and tourists in their droves. The course doesn't quite take you through the viewpoint, but I think this is a good thing because doing so could possibly lead to conflict between runners and large groups of people enjoying the view. BACK TO FINISH - down, down, up. But don't be put off by that because the course is simply stunning. 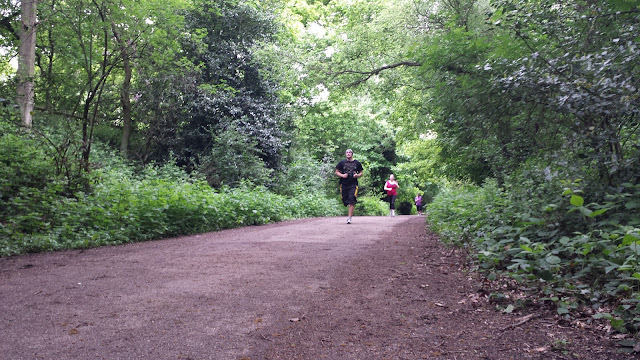 You'll start next to Hampstead ponds (course A only), then take in a bit of the heath, you'll run through a selection of tree-lined paths - the nicest of which is Lime Avenue, past Highgate ponds, up to the highest point of the course and then back down. The course never feels boring or predictable and I loved it. When you finish, you may even want to run the course again - I did partially, mostly to take some more photos. 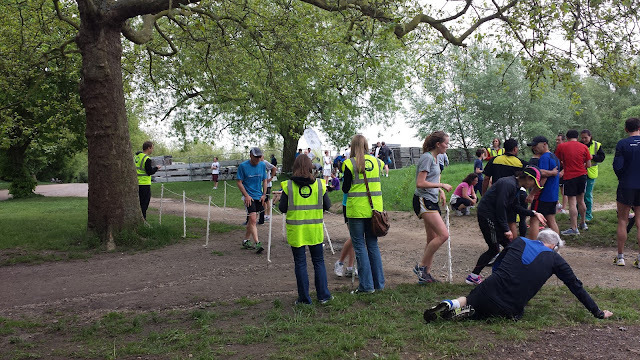 This must be the one of the most iconic venue in parkrun's portfolio. Numerous films have scenes that were shot here including Notting Hill, 101 Dalmatians, Notes on a Scandal, and The Omen (Yes, the sight of a rottweiler did freak me out a little). Legend has it that Guy Fawkes had planned to watch the destruction of Parliament from the viewpoint at the top of Parliament Hill. Hampstead Heath is like a village within London and running on the Heath you could quite easily be fooled into thinking that you are in the countryside. There's no traffic noise and it feels rural. 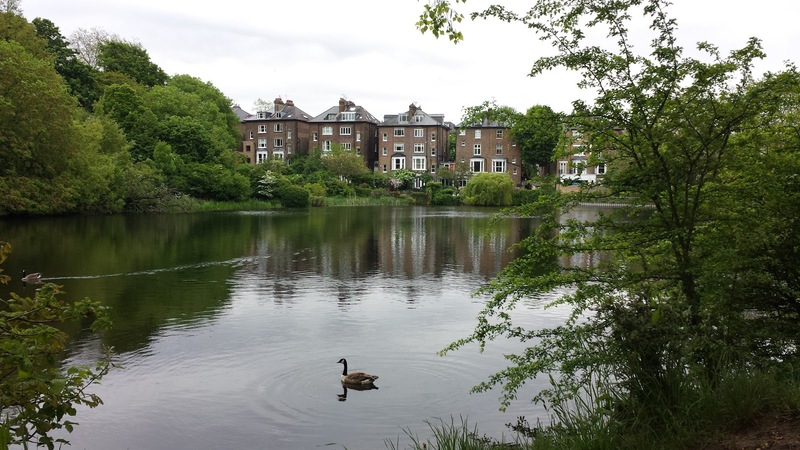 If you explore the area some more, you'll find that there are twenty-five ponds, an athletics track, tennis courts, lido, eight children's playgrounds, Kenwood House (and its false bridge). Also, the list of wildlife that lives here is incredible. To be honest, I haven't even scratched the surface of things that you can do here. To clear up the point about dogs from the beginning of this report - Yes, there are a lot of dogs on the heath, but during the run I did not once feel threatened or even come into close contact with any. Also I didn't see any dog mess anywhere. Even though I'm not a particular fan of dogs, I was quite excited to see a Great Dane and also a few Dalmatians (sadly quite a few short of 101). 131 runners took part on the day that I ran. I didn't see any buggy runners but this course would be totally fine for anybody that wanted to do so - It'd give a good arm workout during the uphill sections and be a lot of fun for the occupant of the buggy on the steep downhill part! The volunteers were, as usual, amazing. Thank you very much for having me!